Britain's Lizzy Yarnold wins the final skeleton World Cup event on the Sochi track, exactly 12 months since she claimed Winter Olympic gold in the Russian resort. 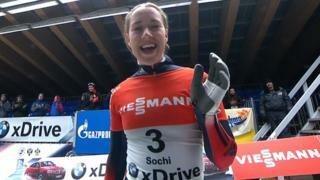 Janine Flock became the first Austrian slider to win the World Cup title, finishing just 20 points ahead of Yarnold, who missed one round of the championship in Calgary because of dizziness. Britons Laura Deas and Rose McGrandle finished ninth and 13th respectively.